There’s a buzz in the air right about now. It sweeps in right around the holidays and it stays through to the new year. Perhaps it’s the family stuff: the in-laws to host, the meals to be cooked, and the gifts to be purchased. Or maybe it’s on the business side: the promos to post, the sales to push, and the numbers to hit. But I’m always amazed how this season of rest, joy, and togetherness can feel anything but. How quickly it can snowball into a time of exhaustion, stress, and overwhelm in both life and business if you let it. You see, one of the reasons I LOVE helping others with this mindset work is because I believe you always have a choice if you’re willing to see it. One of the most rewarding parts of being an entrepreneur is embracing the freedom and flexibility that your business has created for you, which means living by your own schedule, priorities, and boundaries without sacrificing results either. I want to open you up to the possibility of working smarter, not harder. I want to show you that your ability to rest is a strength, not a weakness. And I want you to know that busy, doesn’t always mean better. Because when you lean into building your life and business in this way, you start to see more of the results you want, not less. Today in the journal, I’m sharing how to create more time for what you’d rather be doing this holiday season, WITHOUT sacrificing the success of your business. Have you ever noticed how when you ask a friend or family member you haven’t seen in a while, ‘How are you?’ or ‘How have you been’ their default response is almost always, ‘BUSY.’ Now that might very well be true, but I think it’s important to recognize that busy doesn’t necessarily mean that you’re using your time wisely or that you’re moving closer to your goals. I’ve even found myself falling into the trap of wearing busy as a badge of honor from time to time. I’ve found that the problem with constantly being busy is that it becomes the new normal. It begins to feel uncomfortable when you DO have free time and when there is more space in your schedule. But here’s the real mindset shift there: isn’t having more free time almost always what you’re working toward as you define your own version of success? So often when I ask entrepreneurs what they really want, what made them start this crazy road of entrepreneurship in the first place, it was freedom and flexibility that they’ve been craving all along. I probably don’t need to point out that constantly feeling busy, drained, and stressed is the exact opposite of that. WHY are you busy? And is it time to delegate? In business, there are seasons of growth when you’re learning a new skill, stretching yourself in new ways, and just learning how to do this thing called entrepreneurship. But I like to think of those seasons as book-ended with seasons of rest. So, if you’ve found yourself in a perpetual season of hustle that’s feeling unsustainable, it may be time to look at what it is that’s filling your schedule. We go deeper into this on episode 8 of One Simple Shift with Ashley Gartland, but one of the best ways to free up more time in your schedule is to delegate or build a team. Perhaps for you, this means hiring extra help during this busy holiday season or maybe it’s part of a big-picture shift in your business. Either way, it’s essential that you shift your mindset to view delegating as a way to grow your business and ADD to your bottom line, rather than take away from it. Constant busy-ness can hold you back in other ways too. I have a friend that felt like she was always caught up in day-to-day activities of running her business. She felt like she never had time for the kind of big-picture thinking that drives income and impact. But as the CEO of your business you’re essential to driving the bigger vision behind where your business is headed. That kind of big-picture vision takes time and space to cultivate, so if you’re constantly filling your time with the minute details you may not be moving your business forward as much as you might think. 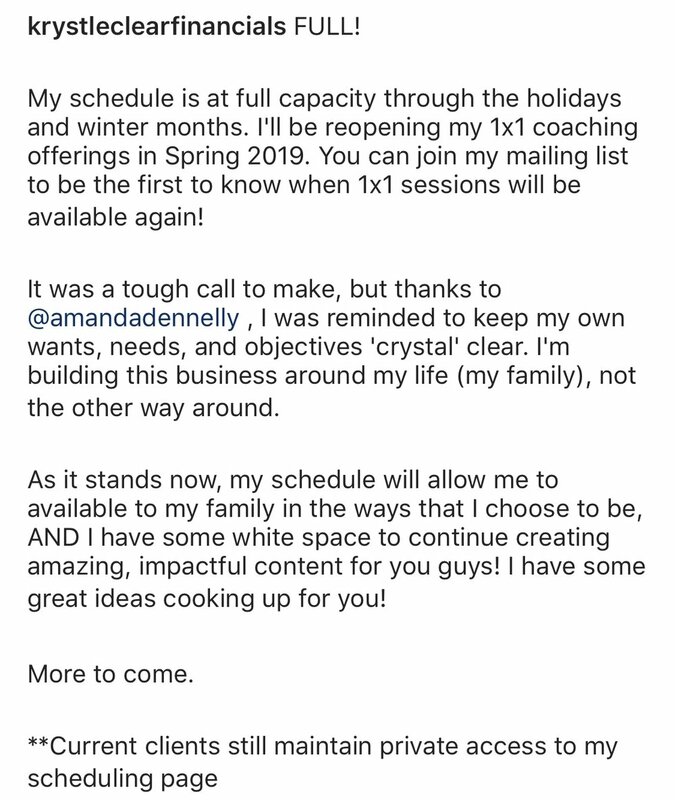 When she shifted her mindset to view that white space in her schedule as a business-building activity rather than taking away from her bottom line, of course, she was able to create more of it and hit more of her goals as a result. One of the most common mindset blocks I see in new solopreneurs is not differentiating the difference between being busy and being profitable. In most cases, they’ve left a full-time job, are no longer working a 9–5 and are overwhelmed by the sheer amount of unstructured time they have available. So what happens when we have lots of time on our hands? Well, we fill it, of course. But here’s the thing: just because you’re busy doesn’t always mean that you’re focusing on the RIGHT things to turn a profit. In fact, so many of those business-building activities can be mere busy-work if they’re NOT bringing leads, clients, and customers through the door. For example: you may be spending time creating graphics and pinning all your blog posts to Pinterest, but if you don’t have a newsletter opt-in or a way to nurture that relationship and engage after that, you may be missing out on leads and profitability in the long-term. This tip isn’t only for new entrepreneurs, either. Even more seasoned business-owners can benefit from taking a look at their to-do list and reevaluating which activities are actually generating revenue. Remember that not all tasks are created equal—some will have far more impact in helping you reach your goals and create revenue. So if you’re feeling overwhelmed by how many things there are to DO, it may be time to look at those tasks you know will grow your business which you maybe putting off or avoiding and filling with busy-work instead. Because THOSE are the things that will make you more profitable in the long run. Because if you’re constantly busy as a business owner, but it doesn’t mean more money in the bank...is it worth it? You see, in most cases, the tasks you need to accomplish take as long as you let them. If you have the whole afternoon to write that newsletter, there’s a good chance you’ll find yourself distracted by scrolling social media or looking for that dress for your friend’s wedding. That’s not necessarily a bad thing either, but it’s a good reminder that your work can take longer when you don’t give it the focused attention it needs to just. get. it. done. This is one of the reasons I focus so heavily on creating an ideal weekly schedule within my Future You coaching program. When you start batching tasks and giving those tasks a set container to work within, magic happens. You become more organized, you get more done in less time, and best of all, it becomes a habit. For example, I know that every Tuesday I release a new episode of my podcast One Simple Shift. So every Tuesday morning I have a dedicated 15-minute block of time when I sit down to send the show notes to my newsletter list. Working in this way puts a cap on how long I spend on this task, keeps me on track, eliminates decision fatigue, and most importantly, helps me get it done. Be careful not to fall into the trap of wearing busy as a badge of honor. Ultimately, YOU have control over your schedule and you have the power to choose what you say ‘yes’ to. Shift your mindset around what it means to YOU to be ‘busy’ so that you can start freeing up more time by delegating to a team, batching tasks, or creating smaller pockets of time in your schedule. Because ultimately, more time for the things that are most important to you is what it’s all about as an entrepreneur, and that lasts long after the holiday season. What’s one way you’re freeing up time in your life or business this holiday season?